While most of the guests will be looking forward to seeing the bride, the wedding wouldn’t be complete with the groom. There is an unwritten rule that the groom’s outfit should not clash with that of the bride’s. There is more than one way of dressing up for the big day besides the usual suit, however. Let’s look at all the options you might find at the bridal studio in Singapore. Some people use the words “suit” and “tuxedo” interchangeable but these are two different types of clothing although they look quite identical. If you’ve ever seen a James Bond movie, then you might have noticed how he’s always dressed in a clean-cut suit. A suit is a complete set of clothes made from the same type of cloth. Its most important pieces are the jacket and trousers. A tuxedo, meanwhile, uses satin on some parts of the clothing such as the buttons, lapels, pocket trim and the side stripe on the pant legs. Traditionally, tuxedos from the interesting wedding bridal studio in Singapore should be worn with waistcoats and bow ties. Suits are worn over a collared shirt with necktie. However, most suits and tuxedos today use a variety of materials so there are some exceptions. One such example is the white dinner jacket outfit. It is a tuxedo but it doesn’t have any satin on the turn-down collar shirt, black pants, white dinner jacket and black accessories. 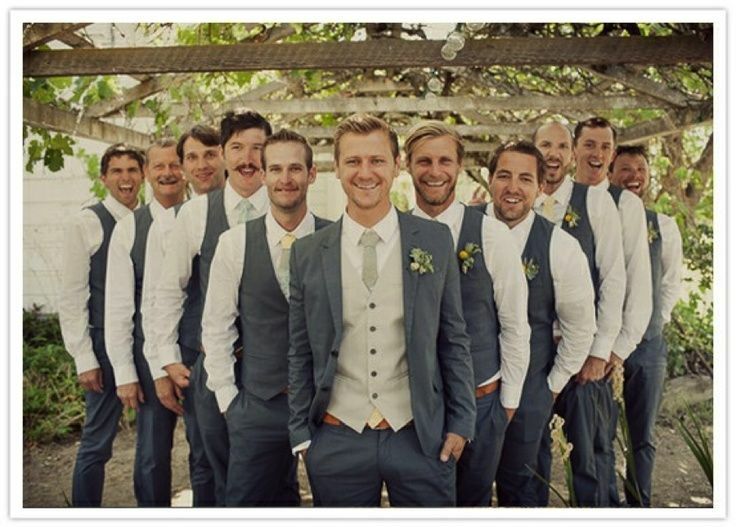 When it comes to choosing the color for your suit or tuxedo, it will depend on the theme of the wedding and whether the groom wants to match his outfit with the groomsmen or complement the bride’s gown. Traditional tuxedos have black waistcoats, pants and jacket over white shirt. Some grooms however might want to vary the combination of black and white or go for gray or tan. Consider how many people might be wearing suits on your wedding day. You wouldn’t want to blend in with the crowd because it’s your wedding after all. Choose from a variety of styles and combinations available at the bridal boutique in Singapore. Your suit or tuxedo should make you stand out from your guests to commemorate the once-in-a-lifetime event. Blazers were originally worn over the white shirt and made from a solid-colored cloth usually black or navy blue. A suit jacket was made to wear over a suit, but that is not so simple nowadays. It’s difficult to distinguish the two just by looking at them. There really is no difference. But one thing that makes the suit jacket stand out is that it comes with a set of pants that matches the cloth and color. The suit jacket is always paired with matching pants. The blazer doesn’t come with pants. There is no rule, however, that says you can only pick one over the other. In fact, your bridal studio will encourage you to mix and match the pieces for a more modern look. You can wear a blazer instead of the matching suit jacket over the pants for variety. A tailor-made matching outfit looks boring, so ask the bridal boutique in Singapore for other colors and designs to choose from. Most bridal boutique will advise you to pick neutral and classic colors for your pants. That’s because black, navy blue and gray never go out of style. These colors also will not clash with a brightly colored suit jacket or blazer. Why pick a solid two-piece suit or tuxedo when you can put on an ensemble with contrasting colors? 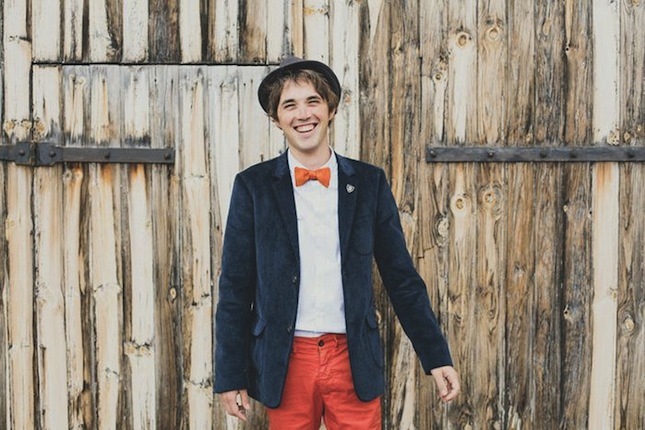 Depending on your wedding theme, add some twist to your outfit so you don’t get mistaken for one of your groomsmen. Put on a blazer over colored pants. Don’t be afraid to try checkers, stripes and other patterns. That option gives you more control of what you actually want to wear on your special day. Your dress shirt is just as important as your suit or tuxedo. A clean white shirt is the most ideal for any color and will complement the bride’s white gown. You can also pick other colors like cream and light blue. Wear an undershirt during your wedding for extra protection. Don’t stop there. You can also wear cardigans, waistcoats and colored shirts and jeans. You can also choose to go with an open collar and no tie or bowtie. Choose from high stance or low button stance waistcoats depending on the cut of your suit jacket or blazer. Just make sure that you’re not gonna be sweating a lot under all those layers of clothes if the wedding venue is outdoors in Singapore. The bridal studio also offers a selection of ties and bows in different colors, fabric and patterns. Think of these as accessories that will enhance your outfit and will mark you as the other important half of the wedding. Don’t forget to accessorize the boutonnieres and buttonholes which will be the equivalent of your bride’s bouquet. Some grooms also choose to adorn the pocket squares and cufflinks. You can choose a contrasting color of pattern for the handkerchief, while your cufflinks should reflect your style and personality. Try not to wear white socks if you’re planning to wear black or dark blue pants. You can play with your choice of socks, however, so you don’t have to stick to one color or pattern. 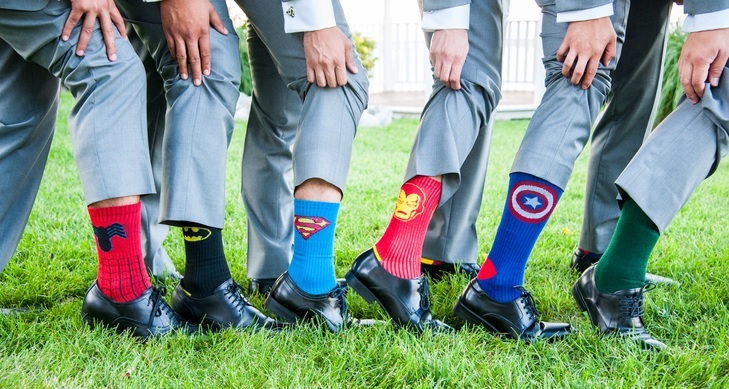 You can try to match your socks with your groomsmen’s socks too. As for your shoes, the ideal colors would be either black or brown. Classic design and colors never go wrong, but you can change them depending on your wedding theme. The goal is to set yourself apart from all the other men attending the event.